Just completed my new quilt display rack. Made out of quarter sawn white oak. Beautiful and a terrific way to use up dead space. That is really very nice!!! Donald, I wanted to add, the quilts on your new rack are gorgeous! Are they your quilts (did you piece them and quilt them) or are they customer's quilts waiting for a pick-up? What machine do you have? Just curious. Anyway, welcome the forum. Apparently I missed your first few posts. I am not a quilter. My wife Jan pieced and quilted the quilts. Our long arm is a Gammill Vision 26-10. Wow, Donald, this is a beautiful original. A lot of us quilters are "drooling"! Jan's quilts are beautiful and how lucky she is to have a husband who is so talented, too. We have others on here with Gammill's as well as A1's and Innova's and a few other brands that aren't coming to mind just now. All are welcome here. Hope to see more of your posts. Very nice , have you and your wife made u-tube clips ,your overhead lights look like some I saw from there from a very loving husband who dearly supports his wifes quilting and tackles many projects to make her quilting life much easier ,and the son even helps mom and dad . Great way to display all those yummy quilts! Yes there is a video posted on you tube of some the of the things I and Jan have made. It was filmed by my son. I really need to update the video as we have made a lot of changes/additions. This just got added to my favorites for "when we get our new house built someday"! What a cool way to display multiple quilts and use usually unused space. Do the arms swivel from side to side? I watched all your u-tube clips , you and your family work so great together ,I really enjoyed watching all of them ,looks like you have really done alot more ,the quilt rack is awesome !!! Love the quilt rack. I wish you would consider selling the pattern. My husband is quite crafty when it comes to woodworking. I would love to have him make me one like that. Donald, you do beautiful work, and your wife's quilts are beautiful, too. 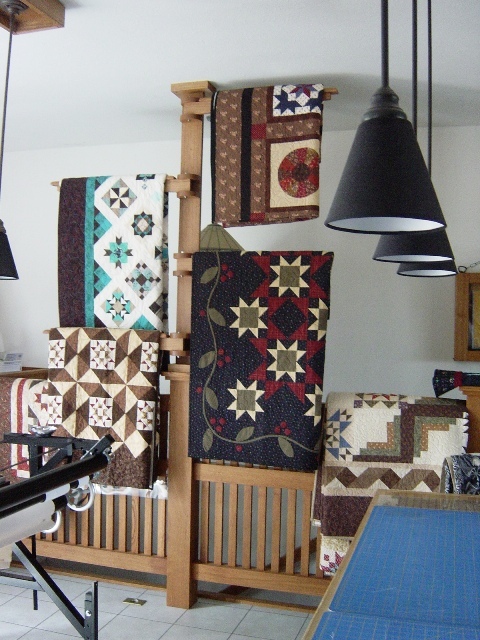 The design element of the quilt rack looks really versatile as in you could make something like that so it is flush up against a wall and it wouldn't take up too much floor space for those of us with smaller homes like me. I just love it. Have you considered making these to sell? I would get in line for one. Also, I love the lights you have over your wife's machine and cutting table. They look classy and very unlike mine. LOL Do you mind posting your u-tube link? I would love to see what else you are making for your wife so I can nag my DH a little more.